The year is 1929. A mysterious carnival has come to town. Special thanks to play testers Tosh Bibb, Norman Rafferty, Steph Cherrywell, Sarah Adams, Siadmander, and Scroll Lock! 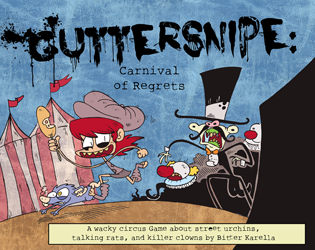 Guttersnipe: Carnival of Regrets is written in the Quest system and requires installed Quest software (available for free at http://textadventures.co.uk/quest) to run. 2017 Spring Thing Festival of Interactive Fiction (springthing.net).